"This is the story of a 'lost' classic album. 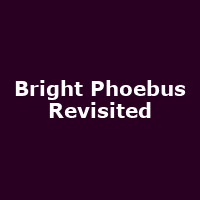 Written by folk luminaries the late Lal & Mike Waterson, Bright Phoebus was released in 1972, attracting little interest and largely shunned by critics at the time. It is now considered one of the definitive recordings of the genre. Mixing dark poetic ballads of life, death, love and longing with, at times, Sgt Pepper pop-like sensibility. This project draws together the remaining members of the Waterson family plus special guests, to celebrate the life and work of Lal and Mike through their music. They will perform the album live for the very first time and also previously unheard and unreleased songs of Lal and Mike."